Astonishingly, there has not been an exhibition about Cubism in France since 1953. This will finally be rectified next week when the Centre Pompidou’s deputy director and curator Brigitte Leal unveils an exhibition that explores Cubism in “all its facets and complexity”. Featuring 300 works and documents, the show seeks to position Cubism and its impact within the wider context of art history and the First World War. T he term Cubism was coined by the French critic Louis Vauxcelles in 1908, when he described the recent work of painter Georges Braque as bizzareries cubiques, or cubic oddities. Later, in 1912, the French poet Apollinaire used the term “exploded Cubism” to define “the art of painting new compositions with elements drawn not from visual reality but entirely created by the artist”. Pablo Picasso, Portrait d'Ambroise Vollard (Detail), 1909-10, oil on canvas. © Musée des beaux-arts Pouchkine, Moscou/Bridgeman. Images © Succession Picasso 2018. “It’s the complete story that we want to present,” Leal says. “Not only the creations and radical experiments by Braque and Picasso [who co-founded Cubism in 1907], followed by Fernand Léger, Juan Gris and Robert Delaunay, but also Cubism’s presence in [the Parisian fairs] Salon des Indépendants and Salon d’Automne, in 1911 and 1914, and its national and international reach.” Important loans include the painter’s portrait of the collector Gertrude Stein, 1905–06, from the Metropolitan Museum of Art and his striking self-portrait, 1907, from the National Gallery, Prague. 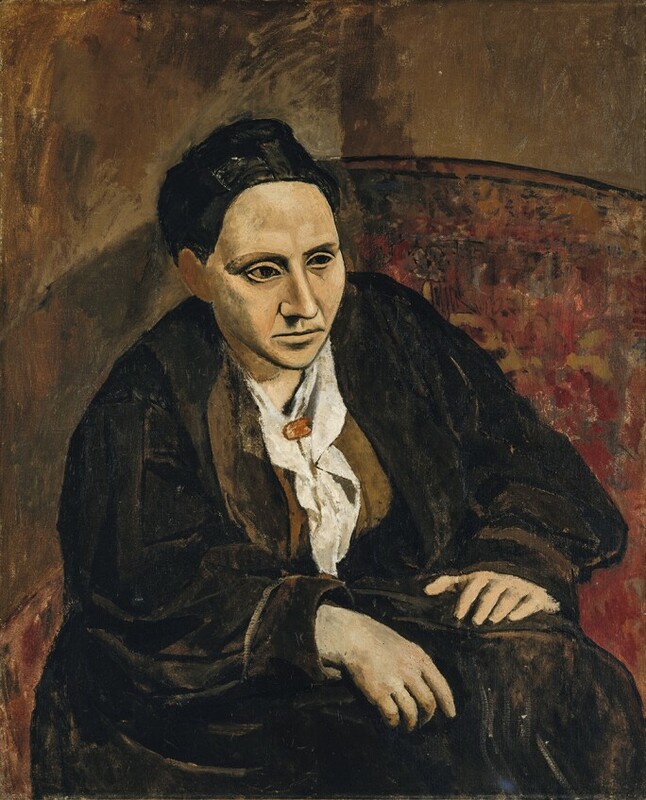 Pablo Picasso, Portrait of Gertrude Stein (Detail), 1905-06, oil on canvas. © The Metropolitan Museum of Art, Dist RMN-Grand Palais / image of the MMA. © Succession Picasso 2018. 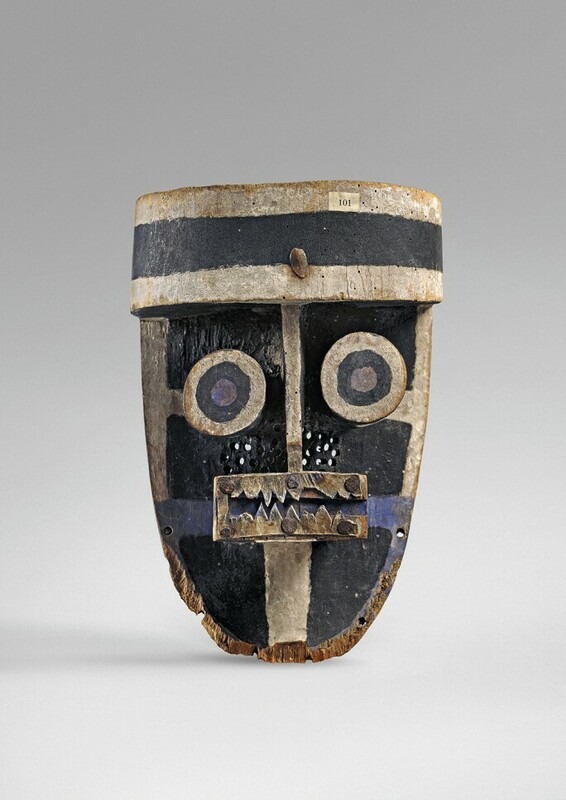 Organised chronologically and thematically, the exhibition opens with works that influenced Cubism: the African masks that the artists had in their studios and paintings by Gauguin and Cézanne. The link to Cézanne is discernible in Picasso’s still life Pains et compotier aux fruits sur une table, 1908–09, and his painting of hilltop houses, Maisons sur la colline, Horta de Ebro, 1909. “Braque and Picasso invented a new, post-Cézanne language, pursuing an obliteration of the subject and colour, which distinguishes them from other Cubists like Léger and Gris, who re-introduced the subject and colour,” Leal says. 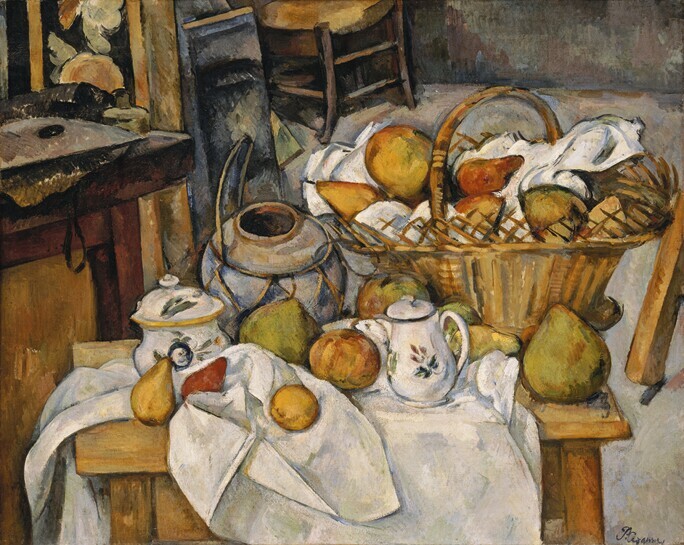 Paul Cézanne, La Table de cuisine (Nature morte au panier), 1888-90, oil on canvas. Musée d’Orsay, Paris © RMN-Grand Palais (musée d'Orsay)/ Hervé Lewandowski. 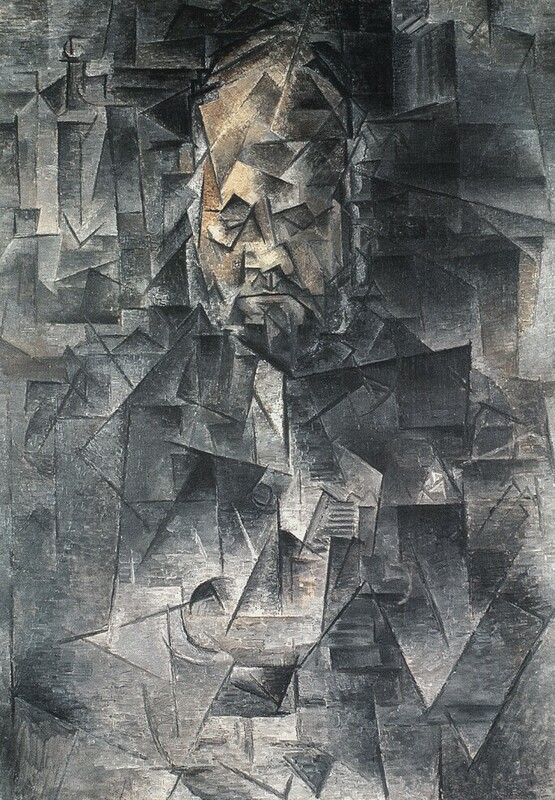 The first “analytical” stage of Cubism, characterised by the breaking down of an object, viewpoint-by-viewpoint into a fragmentary image, is exemplified in Picasso's portrait of the art dealer Ambroise Vollard, 1909–10, on loan from the Pushkin Museum, Moscow, and Braque's Broc et violon, 1909–10, depicting a violin and pitcher almost dissolving cubically, on loan from the Kunstmuseum Basel. The second “synthetic” stage, which saw a flattening out of the image and the dispersal of any allusion to three-dimensional space, can be seen in Picasso’s Feuille de musique et guitare, 1912, with cut-out paper elements stuck and pinned onto paper. Unknown artist, Masque krou, Côte d’Ivoire, date unknown, wood sculpture. Image courtesy of Musée des beaux-arts de Lyon, Lyon. Photo: Alain Basset. © Lyon MBA. 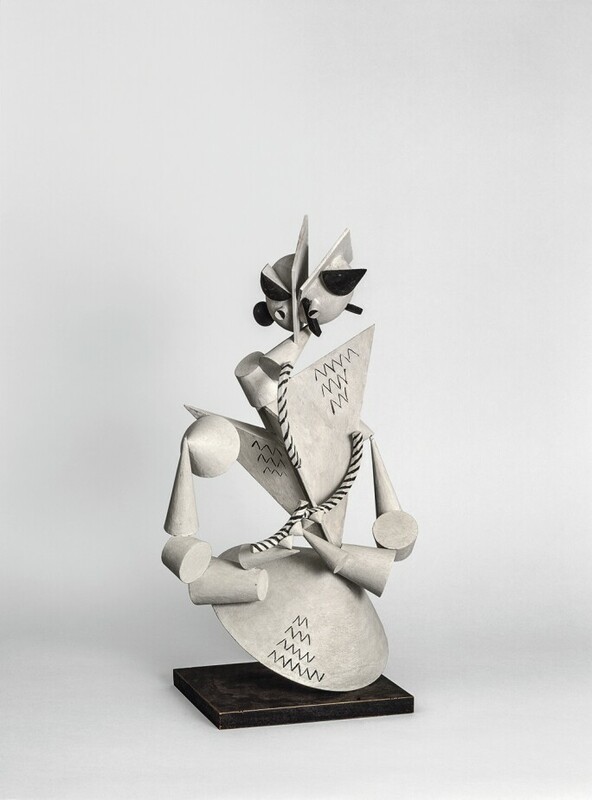 These glued-together collages, assemblages and sculptural constructions became a common component of the movement in its later years, and among the Pompidou’s exhibits will be Henri Laurens’ Clown, 1915, made from painted wood elements, and Picasso’s Violon, 1915, of cut, folded and painted sheet metal and wire. Cubist sculptures by Modigliani and Brancusi are shown too. Henri Laurens, Clown, 1915, sculpture. © Moderna Museet / Stockholm. © ADAGP, Paris 2018. 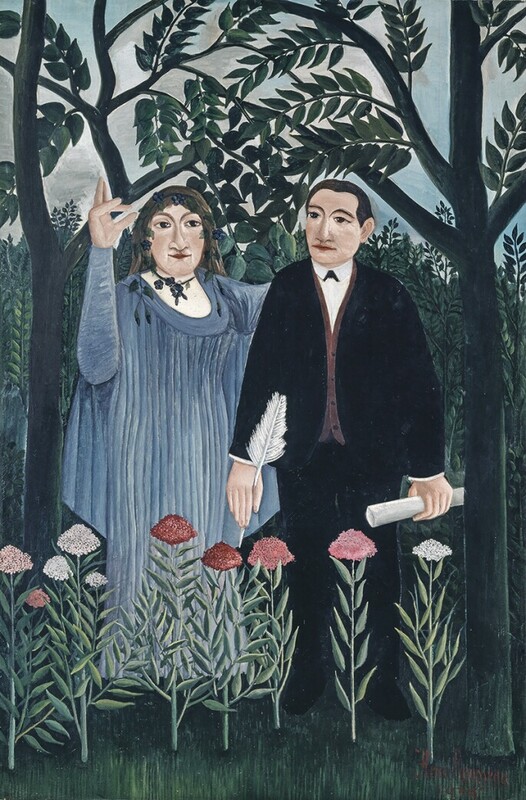 The movement was close to literary circles, as showcased in a room about critics and poets that includes Henri Rousseau’s portrait La Muse inspirant le poète, 1909, of Apollinaire and Marie Laurencin and Picasso’s 1907 portrait of the poet and writer Max Jacob. 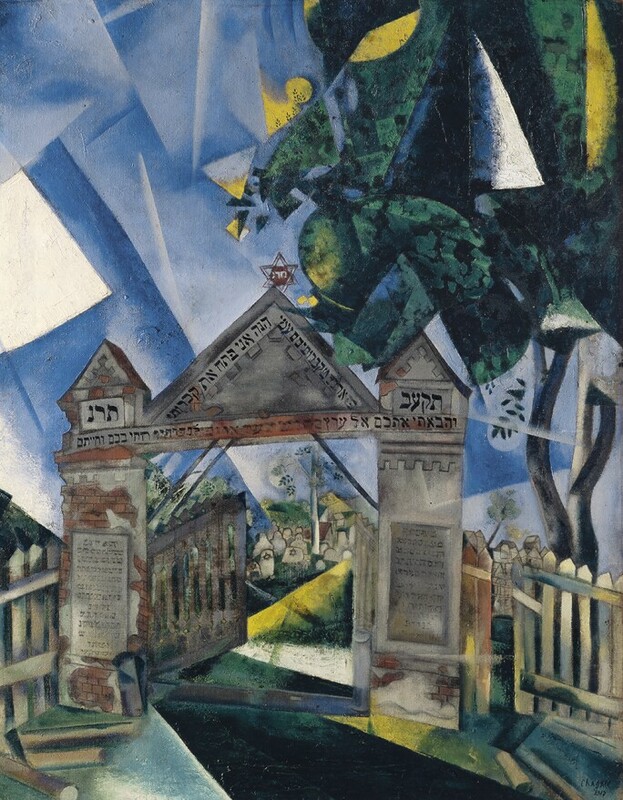 Marc Chagall, Les Portes du cimetière, 1917, oil on canvas. © Centre Pompidou, MNAM-CCI / Dist. RMN-GP. © ADAGP, Paris 2018. The exhibition coincides with the centenary of the end of the First World War, and one room is devoted to works that show how this event affected the Cubists – from Léger's depiction of the trenches to Albert Gleizes’ portrait of a military doctor and Chagall’s painting of the entrance to a cemetery. Spain was a neutral country, but Gris and Picasso “entered the war in an unpatriotic way”, Leal says, referring to the two small French flags in Picasso’s vivid Cartes à jouer, verres, bouteille de rhum (“Vive la France”), 1914–15, also on display in this section. Le Douanier Rousseau, La Muse inspirant le poète (Detail), 1909, oil on canvas. © Kunstmuseum Basel. Photo: Martin P. Bühler.